Aviation ordnancemen (AOs) have some of the more high-risk responsibilities in the armed forces. 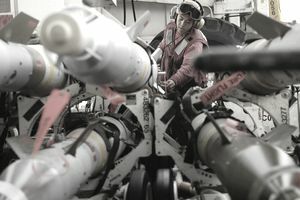 In the Navy, they handle and service weapons and ammunition carried on Navy aircraft. The Navy Occupational Specialty (NOS) code for this position is A420. Their duties include inspecting, maintaining and repairing the aircraft's mechanical and electrical armament/ordnance systems. Aviation ordnancemen also stow, assemble and load aviation ammunition that may include anything from aerial mines and torpedoes to missiles and rockets. They'll service bomb, missile, and rocket releasing and launching devices, and service aircraft guns. And they assemble and test air-launched guided missiles, and supervise the operation of aviation ordnance shops, armories, and stowage facilities. AOs perform their duties at sea on flight decks and ashore in hangars, on flight lines at air stations or in shops under various environmental conditions. They work closely with others, do mostly physical work and require little supervision. It may not seem like a job handling weapons would translate well into work in a civilian field. But after Aviation Ordnancemen are discharged from the Navy, they have skills that qualify them for a range of civilian jobs, such as air traffic controllers or aviation safety inspectors. After basic training, sailors in this rating (which is what the Navy calls its jobs) spend nine weeks at the Naval Air Technical Training Center on Pensacola Naval Air Station in Florida for "A" School training. Once they've completed "A" School, depending on the duty they've been assigned, AOs will either spend two weeks in a ship's company strand course or three weeks in an airwing strand course (strand training is platform-specific on-the-job training). Before they qualify for "A" School, however, candidates pursuing the Aviation Ordnanceman job will need to score 185 in the Verbal Expression (VE), Arithmetic Reasoning (AR), Mathematics Knowledge (MK) and Automotive and Shop Information (AS) sections on the Armed Services Vocational Aptitude Battery (ASVAB) test. Alternately, they could score 140 on the Mathematics Knowledge, Automotive and Shop Information and Assembling Objects (AO) sections of the ASVAB. Aviation Ordnancemen will need to be able to qualify for secret security clearance. This involves a background check of both finances and criminal record. Some prior drug offenses may be disqualifying for this rating. In addition, these sailors need the vision of 20/100 correctable to 20/20, normal color perception and normal hearing. According to the Navy, Aviation Ordnancemen can expect to spend more than half their careers on sea duty assignment.